Hickory, NC- The Crawdads are excited to announce that their post-game Christian Concert series will be returning in 2019. 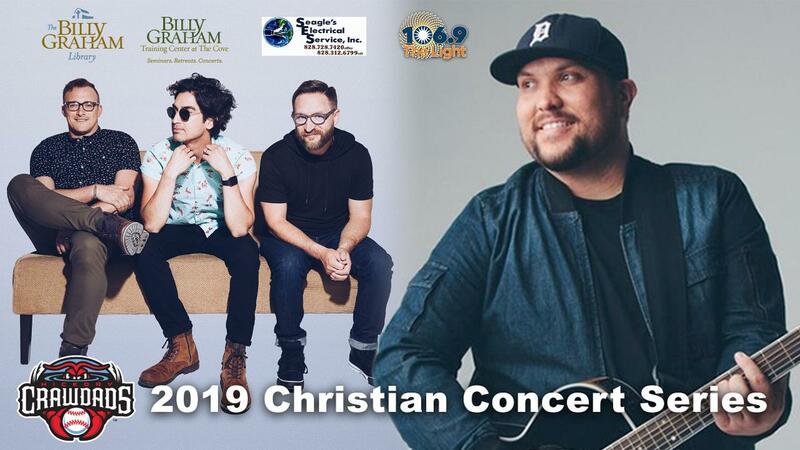 Sanctus Real, presented by Billy Graham Training Center at The Cove and 106.9 The Light, will perform following the Crawdads game on Saturday, April 27th. Micah Tyler will headline the post-game concert on Saturday, July 27th presented by Billy Graham Library, Seagle Electric and 106.9 The Light. The Crawdads games on both days will begin at 5pm and the concerts will begin immediately following the conclusion of the game. Suites, party patios, picnics, and group tickets are currently available for both concert dates. Individual tickets will go on sale at the annual Crawdads Spring Fling on Saturday, March 23rd. Individual tickets will be $16 while the group rate (for 20 or more) is only $12. Tickets include admission for the 'Dads game and the post-game concerts. Sanctus Real has been recording for over 20 years and have released six studio albums. The group won the GMA Dove Award for Modern Rock Album of the Year in 2005 for their album "Fight the Tide." They have been nominated for six other GMA Dove Awards and a pair of Grammys. Sanctus Real says the focus of their music is hope found in an unchanging savior and how change can bring about personal redemption. "We're a group of guys making music together as opposed to a group of guys getting behind a song. We're focusing back on the simple message of the gospel," says drummer Mark Graalman. "It's the simplest message of God's love." Micah Tyler made a splash in the industry with his Christian pop album "Different" in November 2016. The album earned Tyler a nomination for New Artist of the Year at the GMA Dove Awards. "These songs are battle-tested," Tyler said. "I want to live the music I'm writing. There are some songs I can't write because I haven't lived there yet. When someone comes up to me after a concert and tells me how my songs affected them, I want to make sure they know I can relate." Before making the leap to the music industry, he worked as a youth pastor in southeast Texas. He left his job, moved his family into a single-wide trailer, and began touring 200 days a year. Tyler caught a break when a parody video titled "Millennials" gained 65 million views on Facebook and YouTube. The experience inspired the title track of "Different" and reaffirmed his passion for spreading the word of God. For more information about either concert or to reserve your group outing, call the Crawdads front office at (828) 322-3000 or stop by the stadium from 9am-5pm Monday-Friday.